Syracuse guard Tyus Battle shoots during the first half of Syracuse's game. Mandatory Photo Credit: Kicia Sears, The Juice Online. Syracuse puts its three-game winning streak on the line when it plays No. 10 Virginia Tech on Saturday down in Blacksburg, Va. Ahead of the game, The Juice Online’s Brad Bierman and Wes Cheng give their predictions below. BRAD BIERMAN (Season Record: 2-1): This is how tough the 18 game ACC schedule is to maneuver: Two weeks ago Florida State was ranked No. 11 coming off a narrow home loss to Duke. The Seminoles then had to hit the road to face Pittsburgh two days after the Duke defeat and fell to the Panthers, traveled back to Tallahassee for four days, then to Boston for a Sunday game and fell to the Eagles to fall all the way out of the A.P. Top 25. Two games from completing the halfway portion of its ACC trek, Syracuse has rebounded from four non-league losses to an impressive 5-1 conference record to go to 14-5 overall, but the one week stretch beginning Saturday for SU in Blacksburg against No. 10 Virginia Tech, followed by the same path in reverse order as Florida State encountered, will certainly be revealing about consistency, especially shooting the ball..
We got our first true look Thursday night in the 20 point blitz of Miami of the strength the Buddy Boeheim dimension brings to this team if an opponent plays zone or gives the offense any opportunity to maneuver the ball into his hands for a clean look at a trey. More importantly, Boeheim and four of his teammates were hitting the majority (46%) of the three pointers being attempted against the Hurricanes, which is going to mean problems for opponents most games. Virginia Tech has been stewing all week since going into The Dean Dome this past Monday night and watching the Tar Heels stroke 16 3-point baskets in a 103-82 pounding. The Hokies went through scoring droughts in both halves and foul trouble hampered any sort of comeback attempt once UNC got rolling. ESPN is in town with Kansas-Kentucky providing the lead-in programming, and on an expected seasonably chilly winter night in Blacksburg Cassell Coliseum will be sold out and vibrating for a home team that has been more than waiting to play its next game, and will respond foiling a late ‘Cuse rally – Virginia Tech 75 Syracuse 72. WES CHENG (Season Record: 5-2): Recently, it’s become hard to say just how good Virginia Tech is. To be sure, the Hokies started the season, 14-1, its only loss to Penn State in its non-conference schedule. Virginia Tech then had the benefit of a manageable opening to conference play, dispatching teams in the lower half of the conference with wins over Notre Dame, Boston College, and Georgia Tech. But then came its last three games, two of them against the conference’s elite in No. 4 Virginia and No. 11 UNC. The Hokies were throttled in both, losing by more than 20 points in each game. They’ve now lost three of four games on the road, and have a strength of schedule at No. 135, according to KenPom.com. Nor is this the team that many expected to see heading into the season, with senior forward Chris Clarke dismissed prior to the start of the season, and highly recruited freshman Landers Nolley not being eligible. Syracuse will present an interesting case study for the Hokies. The Orange has played much better as of late, and is looking far more like the team that was picked to finish in the top 6 in the preseason. Virginia Tech is going to start off well and Syracuse will rally to make it a competitive game in the second half. 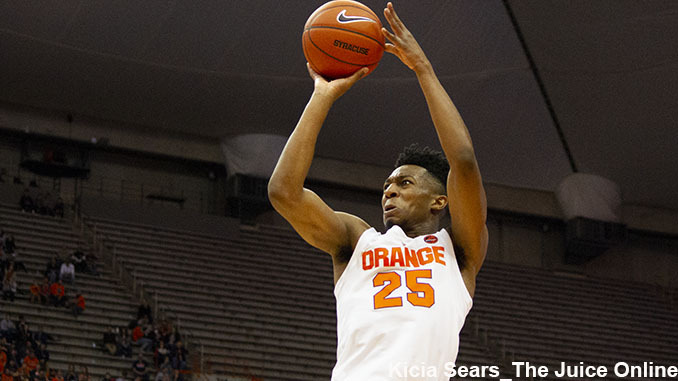 I ultimately see Syracuse guard Tyus Battle leading the Orange to a critical road win, 76-73.